We didn’t use video but I pictured him sitting with his arms crossed and a grin on his face. He had been referred by one of our web-design partners and it turned out he was almost ‘dragged into’ our Skype meeting. He wanted to expand his ecommerce store to avoid relying on Amazon too much. Their organic traffic was declining, so they were desperate to find a new marketing channel. He tried PPC himself but wasn’t too crazy about it. In this article I’ll present my perspective on why ecommerce owners fail with PPC and what can be done instead. I have conversations with founders who run some campaigns themselves (or their marketing guy runs them) and they are “kinda” successful but not enough to call it a spectacular success. 1) Ecommerce owners are afraid to scale campaigns. The guy from the story was one of those “semi-successful” types, but he had one particular campaign that was massively successful (we’re talking 10x ROI) but – for some reason- he kept it low scale – just $400 / month. It was an easy win for us to spot – we scaled it immediately. Then we killed the unsuccessful campaigns and added retargeting for extra profit. Those “few tweaks” made a big difference. Maybe he was too close to see it himself or he was to invested emotionally to push more aggressively. A pattern I see is that an ecommerce owner tries PPC himself or delegates to his marketing guy. They’re spread too thin to dedicate focus to test campaigns and they give up in the middle of the way. The founder shouldn’t be setting and monitoring campaigns. With all urgent tasks in the business, some things will be neglected anyway. 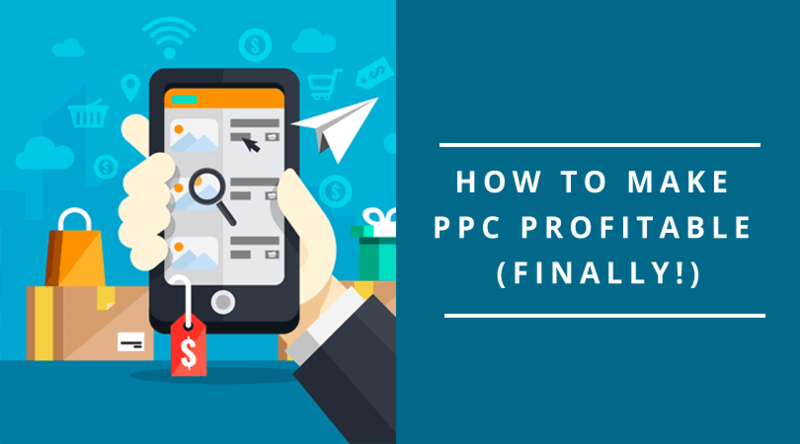 In my opinion the founder role is to understand the principle of how PPC works, get a pro to come up with a strategy, understand the strategy and hand it off to someone to execute. With email marketing it’s easier. You can only add new subscribers to your list, you can only grow. You don’t need to constantly monitor your email list, there’s no risks involved. However, with PPC, since you spend money each month, you need to make sure you’re profitable! Very often the difference between successful and unsuccessful campaign lies in the details, which could easily be missed by an inexperienced person. Also, success with PPC is based on learning, which requires dedication and consistency. And frankly, it’s a bit of a pain in the arse for most people to follow through. It takes seven clicks in Adwords’ interface to see how many sales you’re getting in your home town. Plus pulling reports and interpreting data can be frustrating and overwhelming. There are always areas where you can improve. A person or agency whose only job is PPC will keep running tests, discover and scale successful campaigns which will make PPC more and more profitable. They know how to make PPC work with other marketing channels making email marketing or SEO even more profitable. PPC agencies will have highly-specialized tools and software that you may not have access to when you do PPC in-house. That’s what one prospect who became our client told us. If the agency does web design, but also offer PPC, SEO and all other marketing services, it might not be the optimal choice for your business. Your chances of succeeding in PPC are much higher with an agency that focuses solely on this marketing channel. You can increase your chances of success, by choosing to work with experts who not only do PPC for a living but also know ins and outs of the ecommerce industry. PPC differs across different industries — platforms and campaigns will look different for ecommerce and for example for B2B. If you’re competing with other brands for ad space, it makes the most sense to go with an agency that has a proven track record in the ecommerce industry. They will also be able to give you accurate projections based on their previous success. 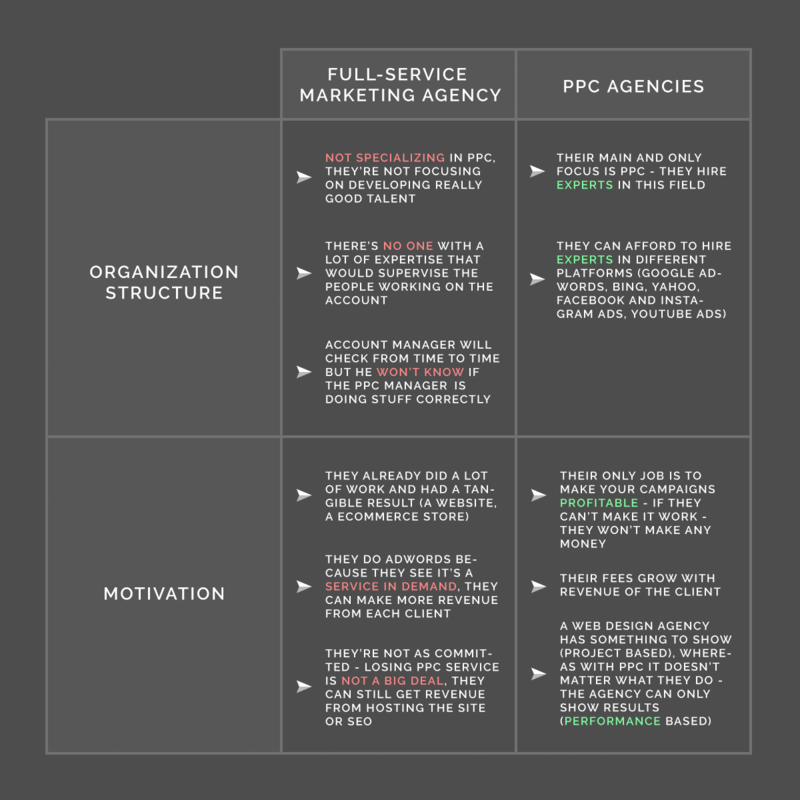 I hope that I managed to convince you that there is a way to make PPC work. If you’re ready to see how my ecommerce-only PPC agency will boost your brand, book my free 30 minute consult to get your custom tailored 6 month roadmap to increased sales and profitability.